It can be challenging for jewelry makers to find unique beads to work with sometimes. I would like to introduce you to Shulamit (Shuli) Raanan, a polymer clay artist who lives in Israel. Shuli, what inspires your work and designs? Living along the Mediterranean Sea and especially in the Middle East is very inspiring. The colors of the sun and the sea, the green of the mountains and valleys alongside the yellow desert, the taste of wine, the smell of local spices, the cultural variation and the rich history of the region are all rooted in me. Since I remember myself, I was inspired by our beautiful nature. I always had the passion to create with my hands and to experiment different crafts and materials. I am very optimistic by nature - That's why I have chosen to concentrate in Polymer clay designs which allows endless colors and shape combinations. How do you describe the process you work by? My works and designs are done with Polymer clay which involves a long and complex process. First I choose the family of colors to be used - warm colors, cold colors etc. I then decide on the principal design I want to achieve. I first construct a Polymer clay cane of the principal design. 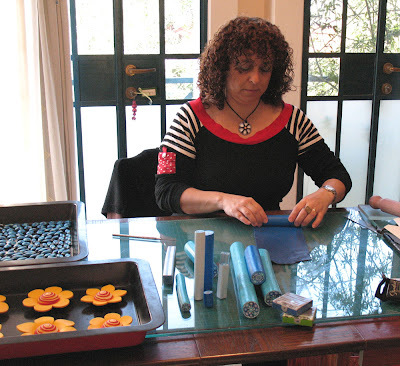 To construct the final cane I start mixing colors with a pasta machine and combine the colors in a special technique which is called "MILLEFIORI". Millefiori stands for "A thousand flowers" in Italian, a technique used originally by Italian glass artists to create colorful and complex glass beads and other ornaments. Using the same technique I combine together a few canes to create a big cane about 20 Cm (7.87") diameter, then I carefully reduce by hand the diameter to the final size of the product I want to get (this stage is very physical but enjoyable). From the reduced cane I design surfaces with complex design to create wall decors, Hamsas, love birds and endless combinations of colorful beads, spinning-tops, necklaces and so on. How do you make the final product? Once I created the colorful canes I design some sketches of the final product on paper. Then I produce a few prototypes from which I choose the exact design, pattern, shape and surface texture of the final product I want to get. The next stage is producing the final product based on the prototype. I combine the Polymer clay with silver and gold chains and charms, I bake the product in an oven and then I apply varnish, drill holes where needed and add it all together with glass beads and accessories to achieve the perfect item as I imagined it. What is your training and education? How does it relates to your work? My formal education is B.ed degree in Technology, Drama and Art and a Master's degree in Humanities, specializing in Art Creation. On top of that, I participated in different kind of seminars and training sessions, in Israel and abroad. Those included topics like graphic design, painting, ceramics, paper works and Polymer clay. My most inspiring and meaningful training was joining a Polymer clay workshop held in Warner spring near San-Diego CA about eight years ago during which I had the opportunity to witness and work alongside world leading Polymer clay artists like Donna Kato, Judy Belcher, Julie Picarello, Carol Blackburn and more. I feel that I still have a lot to learn and improve, I'm all the time seeking new ideas and trying to invent new techniques from different sources of art fields and inspirations like architecture, photography, sculpture, graphic design and more. My main and most important working tool is my pasta machine that enables creation of very accurate layers and stripes of Polymer clay and also to create gradient colors transformations. I also use a few different sharp knives, metal needles, texture stamps, shaped cutters and of course Polymer clay. Without the above I could not achieve perfect results. My best advice is persistence and consistency together with renewing the sources of inspiration from different art fields. To learn from one own mistakes which may lead to new ideas. Never give up when things get tough and frustrating and believe in yourself. I am an art teacher in a primary school so I spend most of my mornings there. I really like working with kids. You can learn from them quite a lot, mainly from their optimistic way of thinking. Besides that I am a mother of three wonderful kids which I love to spend time with. My husband is very supportive of my work and helps me a lot with relating to the Internet and marketing. What makes you happy in your artistic work? Satisfying my potential customers is the most enjoyable and important thing for me. Knowing that my works are viewed, appreciated and purchased all over the world gives me a very good feeling about myself and a confirmation that I am on the right track. I am very optimistic about the future and especially about my artistic work. I regard it as a way of life that will keep on going as long as I have my sources of inspiration. Thanks for the interview you published in your professional blog. Wishing you success and good luck with your unique and inspiring blog. Great interview. It was very interesting and gives me a new appreciation for her beautiful creations. Very interesting post! Shuli designs are so beautiful and unique!! She is so talented!